An entire Easter Dinner made in an hour (or less), baked in the oven together, and all on 2 sheet pans! 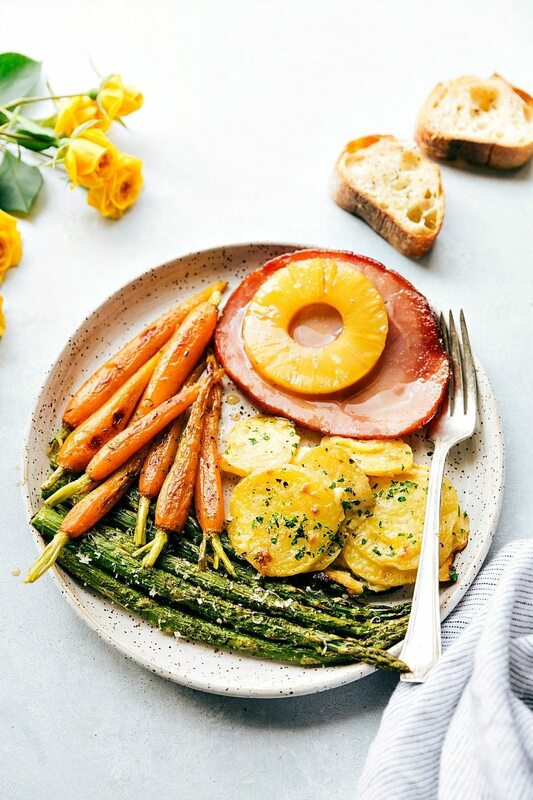 This Sheet Pan Easter Dinner consists of: roasted Parmesan asparagus, honey-butter roasted carrots, pineapple brown sugar ham, cheesy au gratin potatoes, and a toasted baguette. The toddler loves to help pick out my clothes for the day. It’s one of his favorite things to do and no matter how quickly I try to get dressed after a shower, he always shows up with his own agenda of what I should wear. To this date, he’s never actually picked something even remotely color-coordinated or seasonally appropriate, but I’ll humor him and wear whatever he wants me to if I have nowhere to go for the day. Instead of just picking out my clothes, he’s also recently started commenting on various pieces of clothing in my closet. Yesterday he picked up some of my keyhole high heels and gave them a good study. He asked me, “Mom, do you like these shoes?” I replied that I did, in fact, like the shoes. He looked confused at my response and immediately told me, “I no like these shoes. They have BIG holes in them!” He followed up with a request that I not wear those shoes for the day. ? He seems to get more and more opinionated every single day and I love hearing those opinions…well, most of the time. 🙂 And his opinion on this dish? He LOVED it. The carrots and potatoes won in his book, but he had no complaints for the rest of it. I’ve been totally obsessed with sheet pan dinners lately (as I’m sure you’ve noticed) and so I had a blast brainstorming and creating this sheet pan Easter dinner. Not only is the prep time ridiculously little, but each of the individual dishes are insanely good. 2 Extra Large Sheet Pans: one you’ll cook the veggies on and the other will hold the ham, potatoes, and toasted baguette. And that is seriously IT. I supposed you might want a few prep bowls to mix sauces in, but two two sauces (carrots and ham glaze) really could be mixed in the measuring cups you’re already using. You’re not even going to believe how easy clean up is after this meal! Especially if you line the sheet pans with parchment paper — clean-up is a total breeze. The ingredient list may seem a bit lengthy — tons of the ingredients overlap, but I wrote them twice to avoid any confusion. The directions may also seem long, but I broke down this meal into steps you can quickly and efficiently execute. 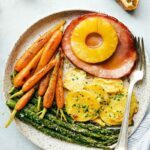 This Sheet Pan Easter Dinner consists of roasted Parmesan asparagus, honey-butter roasted carrots, pineapple brown sugar ham, cheesy au gratin potatoes, and a toasted baguette. Prepare two extra large sheet pans by lining them with parchment paper or buttering both pans. Arrange the oven racks so that one rack is the second down from the top and the other oven rack is the second one up from the bottom. Preheat the oven to 425 degrees F.
Start with the potatoes. Scrub clean and then thinly slice (1/8th inch thick) all the potatoes. In a small saucepan over medium high heat, melt the butter. Briskly whisk in the flour and, whisking constantly, stir for 30 seconds. While whisking constantly, slowly add in the milk and whisk until smooth. Allow to thicken. Add in all of the seasonings. (Salt and pepper to taste; I alway end up adding another 1/2 teaspoon salt). Stir in the sliced potatoes and then cover and reduce the heat to medium low. Allow to cook for 10-15 minutes, stirring occasionally, or until potatoes are fork tender. If needed, add a few extra tablespoons of milk. Remove from the heat and stir in the cheddar cheese. Arrange the potatoes on 1/3 of a parchment covered (or buttered) sheet pan. Sprinkle 2 tablespoons Parmesan cheese over the potatoes. Place the rest of the potatoes on top and then sprinkle with the remaining 2 tablespoons Parmesan cheese. Place the washed (completely dried) and peeled carrots on the sheet pan and drizzle with oil, salt and thyme (if desired). Toss to combine. Separate the carrots to one half of the sheet pan. On the other side of the sheet pan add the asparagus (break off the woody ends). Pour the oil and seasonings over the asparagus and toss to coat. Bake on the bottom rack for 10 minutes; stir veggies around, and bake for another 10-15 minutes or until the veggies are tender. Remove from the oven. For the carrots: combine the butter and honey and melt in the microwave for 20-30 seconds. Pour over the carrots and toss to coat. 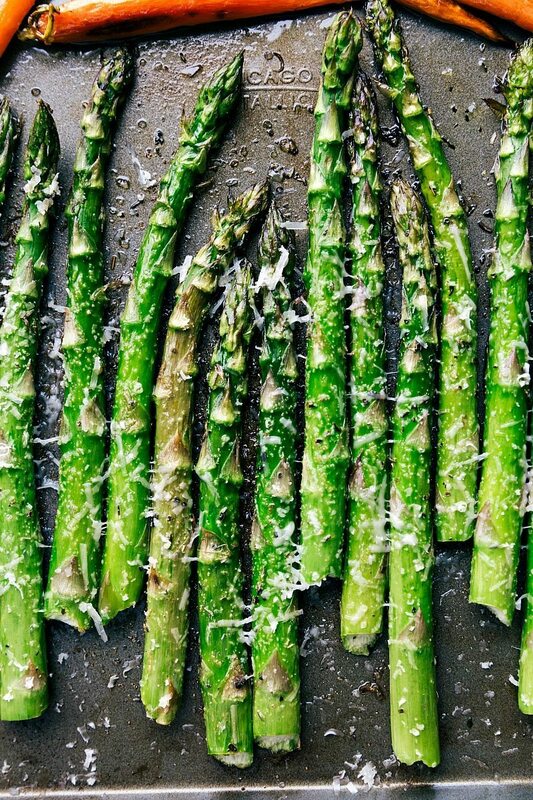 For the asparagus: top with the Parmesan cheese and a squeeze of fresh lemon if desired. Slice the ham into thick slices. Place on the parchment lined sheet pan next to the au gratin potatoes. 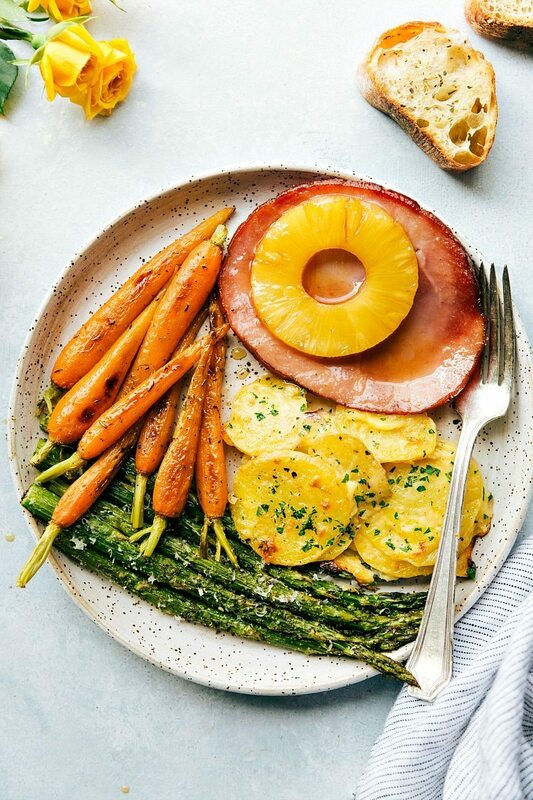 Place a pineapple slice on top of each ham slice. In a small bowl, whisk together 1 tablespoon of the juice from the canned pineapples, 1/4 cup brown sugar, and 1/2 teaspoon Dijon mustard. Whisk. Generously coat all of the ham with this mixture. Bake the potatoes and ham on the top rack for 15-20 minutes or until potatoes are crisp and ham is thoroughly warmed through. Remove from the oven and add the baguette slices on the last 1/3 of the sheet pan. Spread butter over each slice and sprinkle with the Italian seasoning. Cook for another 2-3 minutes or until the baguette is toasted and soft. Remove from the oven and top the potatoes with fresh parsley if desired. Salt and pepper everything additionally to taste and enjoy immediately! *If you only have larger carrots, make sure you slice them in half lengthwise so they can cook in the right amount of time. Hey girl – this looks so good! Your son is so cute! Haha he’s funny! 🙂 Thank you so much! This is brilliant! Each and every photo has me drooling! Seriously…this is genius. I LOVE sheet pan or one pan meals. This is perfect for a lovely but easy holiday meal where mom is not in the kitchen all day. haha! I’m so glad someone else has a toddler who does the same thing. The other day after I got dressed for work my three year old was like Mom, that doesn’t look good….. so I appreciate this post! This meal looks so delish and convenient in an hour! Can you double this if having more people? Thanks!! I think I will be making this for dinner this Easter. I made this. this was so yummy ? Haha! The things I have to look forward to with my little boy! He’s already sassy so I’m sure I’m in for it. This looks amazing. I’m looking for Easter dinner ideas and this looks up my ally. Also I LOVE your plate. Can you share where it is from? Thank you so much Tara!! The plate is actually a custom made Etsy plate 🙂 Her shop name is “Muddy Raven” I hope that helps! About what size are your “extra large” sheet pans? This looks delicious! 1 quick question: Do you cook the veggies first and then are you cooking the ham/potatoes? How did you keep the veggies warm/fresh tasting while waiting for ham? You can cook them both at the same time! 🙂 You’ll do the ham and potatoes on the top rack and veggies at the bottom. If you do all the prep beforehand it works nicely to bake together. Thank you for this outstanding recipe–my first sheetpan meal and my first time making potatoes au gratin. My husband loved it. We are thinking we will pull back on the tarragon and ramp up the salt a little on the asparagus. That’s all–so good! Happy Easter! We made this for Easter dinner. Delicious. Genius. This was great! last minute change of plans left my family of three stuck at home on Easter; so happy to find a complete, classic meal recipe that didn’t call for an entire ham, full day of cooking, or a huge grocery budget. Totally delicious and just the right amount for us to enjoy a day of leftovers. Thank you! I wanted to let you know I made the Easter dinner and my whole family enjoyed it! Everything had great flavor and I received multiple compliments from my family (including our two teenagers). Thank you so much for sharing this recipe! I will definitely make it again! This was awesome! I was short on time and was only cooking for 4 so this worked perfectly for our easter dinner! Main dish and plenty of sides all under and hour! You don’t happen to have a thanksgiving sheet pan dinner do you? ?? 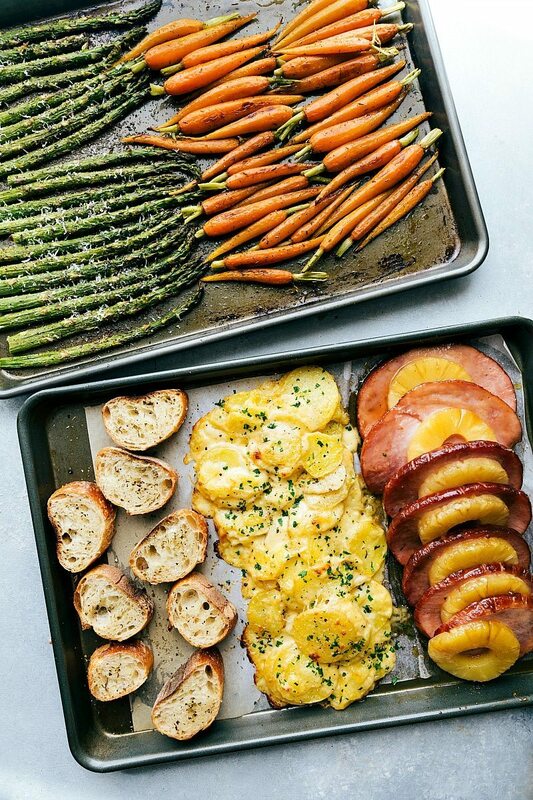 Gorgeous photos and amazing looking Sheet Pan Easter Dinner! I am obsessed with healthy food! I’ll definitely try it! Thanks a lot for sharing Chelsea! 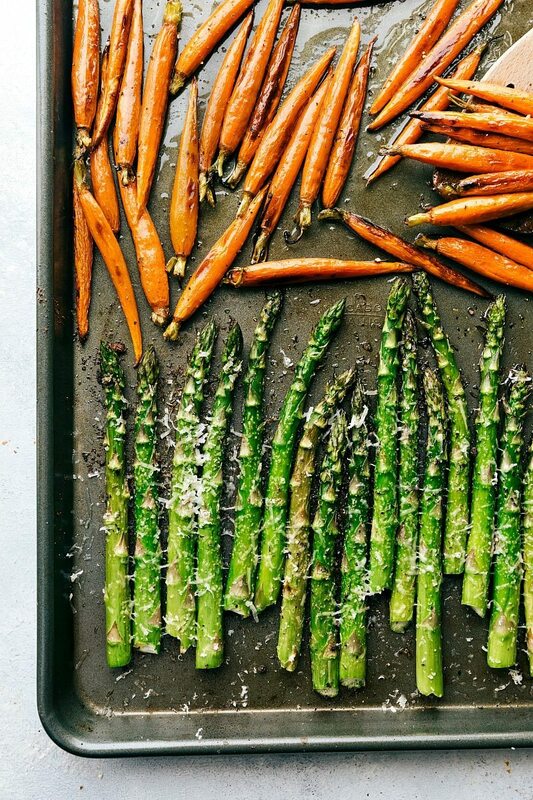 This sheet pan easter Dinner looks delicious, I just want to devour it off the screen! Thanks for sharing, Chelsea!